Sparkling raspberry and pomegranate juices with revitalizing energy. Bursting with berry flavors and energizing caffeine, this sparkling beverage makes a thirst-quenching alternative. 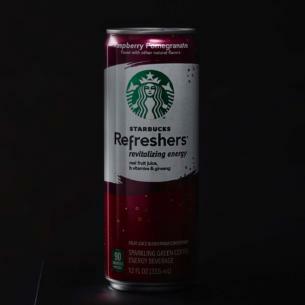 And Starbucks Refreshers™ Raspberry Pomegranate is fortified with three B vitamins plus Vitamin C—for a revitalizing treat you can feel good about. The pomegranate has been cultivated since ancient times.